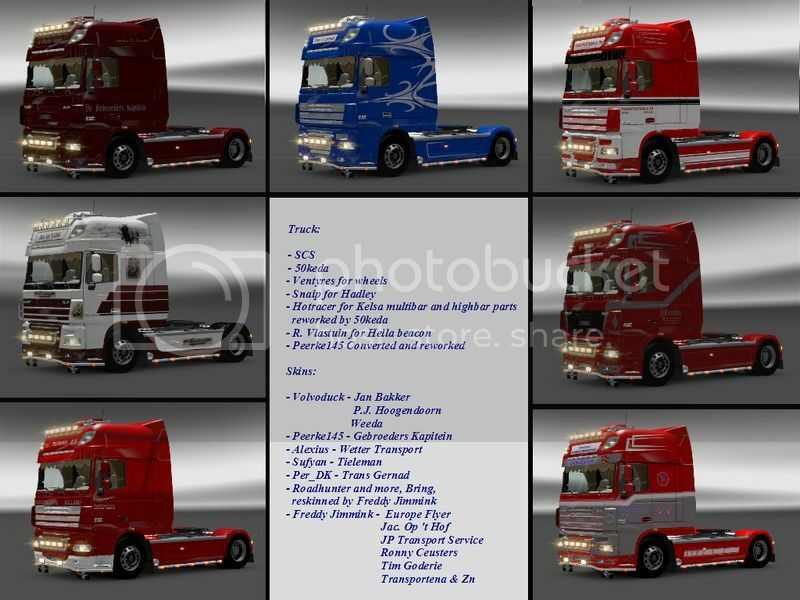 DAF - Page 2 - ETS2 - Trucks - Trucksimulator24 - Die freundliche Trucksimulator Community rund um den Euro Truck Simulator 2, Euro Trucksimulator, German Truck Simulator, 18 Wheels of Steel Reihe, Extreme Trucker und den ZModeler. Antworten im Thema: 12 » Der letzte Beitrag (May 2nd 2014, 11:43am) ist von Transit. All files created by 50keda (the authors) are allowed for use by private individuals. No files included in this package are allowed to be redistributed without permission from 50keda. No files included or parts thereof are allowed to be used commercially. C username)\Documents\Euro Truck Simulator 2\mod. If you are using my SCANIA R 2008 then remove 50k_addons.scs from your mod folder. Old addons are included in new version so SCANIA R 2008 should work normally. and make sure that addon_hookup_storage.sii is loaded after my 50k_addons.scs mod. because game does not allow to have painted addons yet (except sideskrits). In 1.9.x versions painted grill works as it should! It was tested on 1.8.2.5 and 1.9.22 version of game. Reports of issues or suggestions are encouraged! 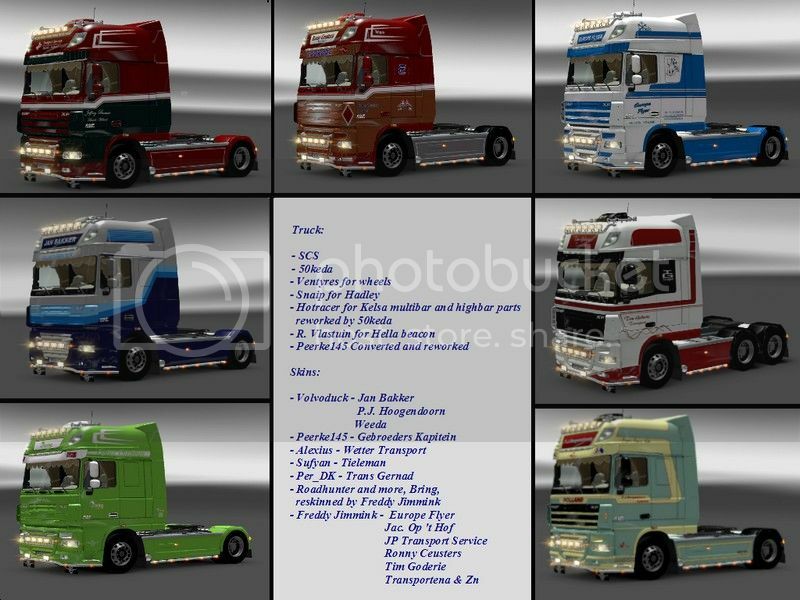 C: ( Benutzername) \ Dokumente \ Euro Truck Simulator 2 \ mod. Wenn Sie meine SCANIA R 2008 werden dann entfernen 50k_addons.scs von Ihrem Mod-Ordner . Alte Addons sind in der neuen Version enthalten, so SCANIA R 2008 sollte normalerweise arbeiten. @ include " addon_hookups/50k-mudflaps.sii "
@ include " addon_hookups/50k-accessory.sii "
"def / Fahrzeug / addon_hookup_storage.sii "
und stellen Sie sicher , dass addon_hookup_storage.sii ist nach meiner 50k_addons.scs mod geladen. Spiel , weil nicht erlauben, Addons noch gemalt haben (außer sideskrits ) . In 1.9.x Versionen gemalt Grill funktioniert wie es sollte ! Es wurde auf 1.8.2.5 und 1.9.22 Version des Spiels getestet. Included 14 skins and 4-spoke steering wheel.